On Tuesday, 6 November the Minister of State Environment, Ibrahim Usman Jibril, said that the clean-up of Ogoniland will start this month. Suffering economic devastation from 1957, Ogoni people have been subjected to the rule of international corporations and complicit Nigerian officials ever since. Whilst UNPO has doubts in the veracity of the minister’s statement, any and all genuine attempts to relieve the livelihoods of the Ogoni people ought to be welcomed. 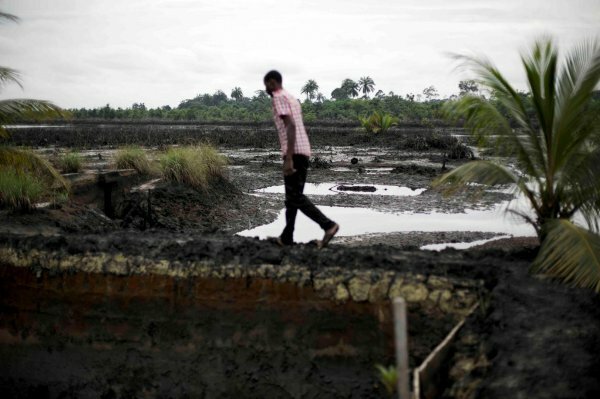 Relief will soon come the way of the people Ogoni whose land has been devastated by oil spill over the years as the Minister of State for Environment, Ibrahim Usman Jibril, has revealed that the Ogoni Land oil spill clean-up will commence this month. He said this yesterday in Abuja when a delegation of the Civil Society Legislative Advocacy Centre (CISLAC), led by its Executive Director, Mallam Auwal Musa Rafsanjani, paid an advocacy visit on the implementation of the United Nations Environment Programme (UNEP) report on the cleanup. “When people are agitating that we are not doing anything since last year when we launched the clean-up in June last year and nothing is happening, my answer has been that we are not in a hurry to fail, whatever is worth doing, is worth doing well. When we came on the issue of Ogoni cleanup, in there was virtually no structure on ground, but we moved that process forward, we did a lot of stakeholder consultation and we got a document that is workable. “We received documents from people which have indicated and as at 2016, we have over 800 companies that are interested unsolicited. This year in March we advertise internationally and internationally, the figure later dropped to about 400 and this 400, we checked carefully and 183 companies have been pre-qualified,” Jibril said.